As ever it’s a pleasure to report that the Spring 2015 CONCEPT journal is now online. Well worth burrowing into its pages. The opening article throws down the gauntlet to those of us still in thrall to the London-Edinburgh’s Weekend Return Group’s 1979 ‘In and Against the State’! This article explores the relationship between community work and the state in the UK in particular. 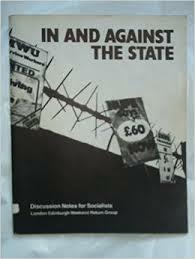 By exploring the relevance and limitations of the book `In and against the state´, the article presents the idea that practitioners of community development can play a role in re-defining the role of the state by changing the discourse from `working in and against the state´ to `working for and as the state´. In this sense, constructing an ideological position regarding what the state should be and which role it should play could be equally as important as developing new approaches to practice in response to the influence of the state. I precede the ‘provocation’ —a word I first heard used by my colleagues Gordon Asher and Leigh French—below with the following caveats. First, I produced this provocation as part of a workshop on Critical Pedagogy that Gordon Asher, Leigh French and I co-organised preceding a day conference on Critical Pedagogies. Second, the provocation that follows, like those of Asher and French, sought to spark off debate; it used David Graeber’s rhetorical argument about paid work today, with its explicit use of the ‘b’ word, to encourage academics at the event to re-contextualise regimes of accountability in the university that they are experiencing and to consider how critical pedagogy could help them do so. Finally, I have been lucky enough to leave full time employment when voluntary redundancy was on offer (being already off work on stress-related sick leave, for the first and last time in my full-time, paid working life). This allowed me to stop being a wage slave and become, instead, as one of my colleagues put it, like Tony Benn who left Parliament to take up politics; I was leaving the university to take up education. This annual two weeks of activism, as a lot of you will know, was started more than twenty years ago by the Centre for Women’s Global Leadership (CWGL) at Rutgers University. This year the theme is ‘From peace in the home to peace in the world: let’s challenge militarism and end gender-based violence’. They’ve called on us to foster what they call ‘a strategic conversation’ on the links between militarism and male violence against women. We write this article on radicalizing community practice and education in the midst of an ongoing global economic crisis related to the neoconservative and neoliberal strategies that have dominated the world stage for more than thirty years. As the Scottish referendum recently demonstrated, participatory forms of grassroots social change have become a possibility again. The referendum revealed that making the case for democratic initiatives which recognize the failures of neoliberal policies has become easier in the contemporary context. We are not, however, naïve about the prospects of change. Crises can result, as with the origins of neoliberalism in the 1970s, in simply new forms of a reasserted class power. And crises can, and certainly do, bring about surges in reactionary and xenophobic (usually anti-immigrant) politics and social movements. The lessons we proposed five years ago in Contesting Community are timelier than ever. The opportunity exists for the development of new theories and practices in and about community efforts. In the aftermath of the independence referendum of September 2014 we decided to conduct research on how people learned and educated themselves informally leading up to the vote. Given the range of information and issues people faced, particularly over the final six months of the process, hearing how people made sense of it all is clearly an area of interest – particularly for academics, community educators and politicians. Through an online survey conducted in December 2014, we asked people a series of questions to ascertain, amongst other things, how and where they gained information, how they interacted with that information and how they utilised social media (if they did so).